Roof Racks come in different shapes and sizes so it’s important to select a roof rack that suits your load carrying need needs. We Recommend the Vortex range for recreational applications like carrying a kayak, Skis, Roof Boxes and bikes. 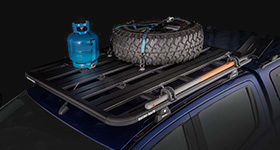 If you’re a tradie and you’re looking to carry commercial type gear like ladders, conduits & timber you might want to opt towards the Rhino-Rack Heavy Duty range of roof racks. The Heavy Duty range is specifically designed for tradies and 4WD enthusiasts. 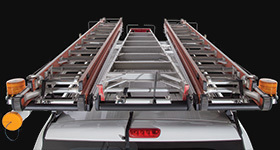 If you’re a 4WD nut we also recommend checking out the Heavy Duty and Pioneer roof rack range. Due to their load carrying capacity and massive range of compatible 4WD accessories including Trays, High lifting Jack holders, Shovel holders and Jerry Can holders, just to name a few. When selecting a roof rack you will want to take into consideration things like load carrying capacity (Load Rating) - this is how much weight the vehicle roof can hold. 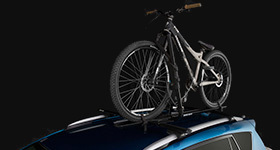 The vehicle will have a stationary, moving and in some cases an off-road load rating which you can find in the roof rack instructions or by asking your local dealer. Also compare the bar length vs the width of the load you’re looking to carry. Now you know which bar you want, you need to choose a mounting system. 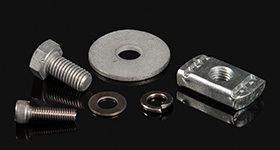 Mounting systems are largely limited by the type of vehicle roof. Go to fit your car and explore the options available to you. Take into consideration how often you will use the racks and if you want a fixed or removable option. 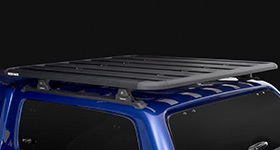 The Backbone is a great system designed to disperse the load over the length of the roof to increase the vehicles maximum capacity. 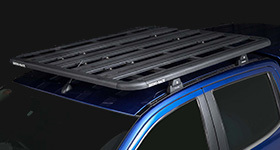 Once you have chosen your preferred roof rack the next option is to choose from our massive range of accessories. If you are looking to carry skis or snowboards you will want to browse the range of ski and snowboard carriers. If you are looking to carry a kayak or 2 or 3 browse the range of side and rear loading kayak carriers. You get the idea. Most Accessories mount to the Roof Rack cross bar either via a channel fitting kit or a wrap around fitting kit. We also have range of products that mount to 50mm towballs and 2" Hitch receivers (eg. bike racks and the T-Load range). Below are fitting time charts that give you a guide on how long it would take a trained and authorised Rhino-Rack dealer to fit particular roof rack systems to your vehicle.